The OTR/Gateway Summer Celebration takes place this Saturday, June 20th from 10am to 7pm in the heart of Over-the-Rhine's Gateway Quarter. The inaugural celebration will build off of the popular GoOTR 5k (route map) that will kick off the festivities at 10am. This 5k raises money for the Over-the-Rhine Chamber of Commerce and started as a way to celebrate the great neighborhood assets of Over-the-Rhine and showcase the exciting changes taking place there. Pre-registration is just $12 and will go up to $20 after noon on Friday, June 19th. All participants will receive a GoOTR 5k t-shirt and be treated to the sights and sounds of the 3.1 mile journey through historic Over-the-Rhine. 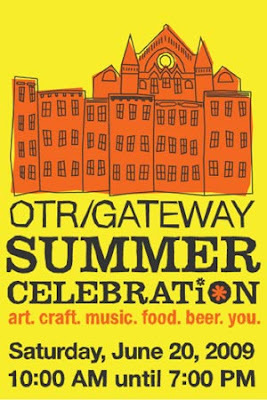 The OTR/Gateway Summer Celebration has been organized by the Gateway Merchants Group and will boast live music, a host of local arts/crafts vendors, food and beer brought to you by Christian Moerlein.